GM Has Potholes To Avoid On Road To Recovery Industry observers say the automaker needs to show that it has conquered its history of inconsistent products that has triggered boom-bust cycles in the past. The new General Motors still has a rough road ahead as it tries to turn its image around, innovate in its product line and expand its overseas markets, analysts and industry watchers said Thursday. GM, which just last year went through a bankruptcy and a government takeover, was reborn as a public company Thursday in a more than $20 billion initial public offering that attracted considerable investor interest. The stock, initially priced at $33 per share, closed at $34.19, up 3.6 percent on its first day of trading. 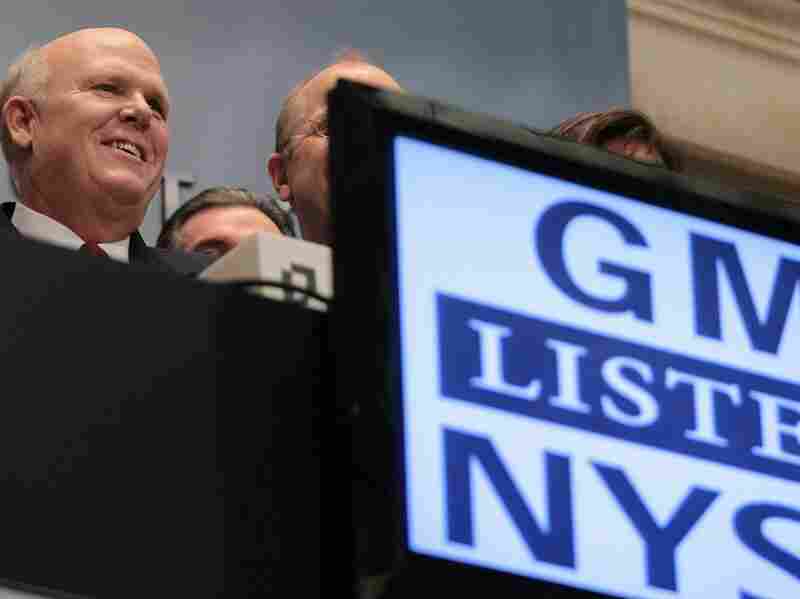 The excitement on Wall Street underscores a remarkable transformation at GM since its bankruptcy in June 2009. A painful -- but quick -- bankruptcy and government takeover left the company free of debts and in a stronger negotiating position with its unions. It also shrank its product line, focusing on vehicles that offered a better chance of market success. But can GM really be headed for long-term health? "In this business, consistency counts," said Bill Visnic, a senior analyst at Edmunds AutoObserver.com. "And for GM, consistency has never been a strong suit." "Now that they've done the balance sheet dance and the Wall Street tango ... we get to see if they've got what it takes to make a go of it from an operational standpoint," he said. In the old GM, labor costs and an unwieldy product line were major drags, but the new GM has largely dispensed with those problems, said Visnic. He and others have identified key areas where the company will need to do better. When GM went into bankruptcy, it not only shed whole product lines, such as Pontiac and Hummer, but divisions such as GMAC financing that strayed from the company's traditional carmaking roots. Instead, the company's management opted to slim down its product line, sticking to the Buick, Cadillac, Chevrolet and GMC brands. But a lot of GM's eggs, at least in the domestic market, are going into the Chevy basket. The Chevy Traverse. a crossover that combines car and SUV features, is "a great vehicle," Visnic said. Demand for another crossover, the Chevy Equinox, is so high that "GM can't make enough of them," he said. But that's not enough to ensure success. Much has been made of the new fully electric Chevy Volt and the compact Chevy Cruze. However, owing to low volume and slim profit margins, the Volt is not going to do much for GM's bottom line in the near term, analysts say. In any case, all of these products were put in the pipeline some time ago, said William J. Holstein, author of the book Why GM Matters: Inside the Race to Transform an American Icon. "The key thing to look at going forward is not how GM products are doing today but whether they can keep moving the ball forward," Holstein said. "GM has done this before, where they've had a string of successful products and then backslid, where everything for several years was crap," he said. "In this business, you just can't do that." In addition, overseas markets -- where newly emerging middle classes are hungry for their first or second car -- will be increasingly vital to GM, analysts say. China recently surpassed the U.S. in the number of vehicles sold, with 13.6 million driven off lots there last year, according to the China Association of Automobile Manufacturers. That compared with just 10.6 million in the U.S., according to Ward's Automotive Reports. "First and foremost, they've got to get people wanting their cars again -- not just accepting them because they are a good deal," said Visnic, who pointed to the kind of brand loyalty that Volkswagen and BMW have experienced. But rebuilding that image isn't going to happen before the next quarter or even next year, said Aaron Bragman, research analyst at IHS Global Insight. "It took a long time for the American public to become disinterested in GM cars and it's going to take a long time for their interest to return," he said. Bragman and others say GM's product line has made great strides in quality and innovation in recent years and that consistency on that score will go a long way toward changing the company's image. "Image is the real issue here. If GM can recapture the imagination of the American public, that's half the battle," he said.